The Pacific Tsunami Warning Center is part of The National Weather Service that provides real time updates on Tsunami information around the world. You can stay up to date with the latest Tsunami information and what’s happening in the Pacific as a result of the Chile earthquake. 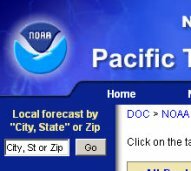 Visit the Pacific Tsunami Warning Center here for the latest Tsunami updates.